Did you ever think you could use the power of the US military for your own self-defense and preservation? Since 1973, Ruger has made the M14 rifle suitable for public use. Law enforcement, security companies, hunters, ranchers, and target shooters all admire it’s rugged, reliable charm. They didn’t stop there – this is just a sampling of traits that make it a shooting superstar. Since 2005, Ruger took the criticism of their loyal customer base to improve an already revolutionary rifle. If you’re familiar with their modern models, you can clearly see that they were good listeners! Their 580+ models steal the spotlight with better accuracy & trigger control than its predecessors. Although these factors make it an excellent out-of-the-box rifle, the best scope for Mini 14 raises its capabilities beyond belief! Out-of-the-box, a Ruger Mini 14 can shoot accurately up to 150 yards with less than 1 MOA in the right hands. You can see the balistics chart here. With the best scope for Mini 14, you can easily triple this shooting range. If you really know your gun well and get used to your scope, you can reach even further with precision. When you look up max shooting ranges, you’ll run into the word “accuracy” a lot. Don’t let that word confuse you. When you hear the word “accuracy”, it’s actually referring to how consistent and clean a gun shoots round after round. It does not refer to how many times you will hit the bullseye. More times than not, human error is at fault for missed targets. Of course, it’s okay to pretend you didn’t just read that before your next trip to the shooting range! However, not all scopes are made equally. Before you jump the gun, consider the best scope for Mini 14 based on your typical shooting distance. Which one describes your needs best? Whichever it is, it’s crucial to know when shopping for scopes. Why? The distance you shoot goes hand-in-hand with your scope’s magnification. You would think that the highest magnification you can find will always be your best bet. That is not the case at all! Would you use a sledgehammer on trim nails? No. Would you use a pickaxe to chop your vegetables? Let’s hope not! The same principle applies to your rifle scope. Simply, the further you are going to shoot the higher magnification you’ll use. What is the magnification and what does it mean? Check out our guide here to understand how lens measurements and magnifications work. First of all, long-range shooting should be left to those with practice. Even with the best Ruger Mini 14 scope, it’s not as easy as it sounds. In these situations, you’ll be using magnification 12x and above. Beyond the shooting range, if you’re shooting medium range you’re probably in hilly areas or otherwise have light brush. You can see so far, but eventually something blocks your vision. In this case, you’ll be using magnifications between 6x and 12x. Short range shooting often takes place in mountainous areas or in self-defense situations. Either way, there is enough in the environment to block your view beyond 100 yards. In this case, going over 6x magnification will just blur your shot. Basically, keep in mind where you shoot the most when looking for the best scope for Mini 14. You wouldn’t use a high power (like 12 times) to shoot a short distance. In this case, such a high power would blur your vision, contradicting your need for a scope at all! On the other hand, you’ll need something higher than 6x to shoot across a large, open field. You’ve already chosen one of the most dependable rifles to keep by your side, but there’s something missing. You aren’t using it to its full potential! Reaching these hunting heights is risk-free thanks to the rifle’s low set ejector. You won’t ever hear a single shell bouncing off of your scope! Complete your self-defense and preservation experience with the best scope for Mini 14 owners. Guess what? You don’t have to dig online for hours! We’ve taken the liberty of finding a scope for every situation. You can also check our best .223 scopes guide. Why spend a lifetime skimming through the infinite gun forums and marketplaces? We have all the answers right here. In this guide, you’ll find the best Ruger Mini 14 scopes for every situation. Simply, this means that you will not have to adjust the elevation (or risk setting it wrong) for longer range shots. All you have to do is use the reticle that matches with the distance you are shooting and pull the trigger. Now that you know what you’re getting into, let’s find the best scope for Mini 14 owners. You don’t want to start your next hunt without it! Much like the Nikon 3-9×40 reviewed before, the Nikon 4-12×40 wouldn’t fail to impress even the most eclectic rifle enthusiast. Carrying the brand name forward, this Mini 14 scope has everything a long-range shooter may want. Its BDC 600 Reticle provides you open circle aiming points with hash marks ranging from 100 to 600 yards. And you can shoot with almost pinpoint accuracy due to the company’s Spot On Ballistic Match Technology that shows all the exact aiming points on the reticle. Worried about the quality of view? Well, thanks to the scope’s anti-reflective compounds, you’ll get crystal clear and bright vision from dusk to dawn. And unlike other Mini 14 scopes that take a long time to adjust focus, the Quick Focus Eyepiece feature lends this model the ability to bring the reticle into focus instantly! Not to forget how easy it is to make field adjustments thanks to the spring-loaded adjustment knob. You don’t even have to be a fan of Nikon to adore this product of excellent craftsmanship. Try it and you’ll notice the difference yourself. The Vortex Optics 2-7×32 Crossfire II is ideal for hunters and shooters in scenarios where guessing the holdover is tough. The Dead-Hold BDC reticle takes the estimation work out of holdover and wind corrections to let you shoot without any worries. No matter the range, you can stay confident that the reticle will never fail to guide. Focusing and adjusting are a breeze as well thanks to the fast-focus eyepiece and resettable MOA turrets. And what about comfort and overall clarity of vision? Well, let’s just say that the anti-reflective, multi-coated lenses have got you covered even in foggy conditions. Even though the vision can get a little fuzzy in very long ranges, it doesn’t flinch when you’re taking medium range shots. 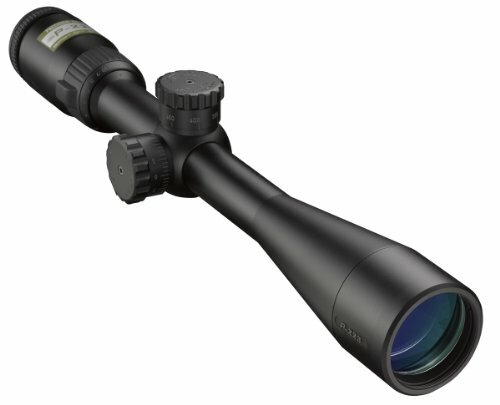 Construction quality of this scope is top-notch as well for the price. Since it’s made of aircraft grade aluminum, adequate durability and shockproof performance are guaranteed. 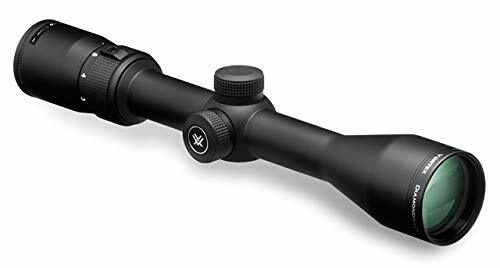 The Vortex Optics 2-7×32 is an excellent product, ideal for anyone who likes to shoot and short to medium distances and doesn’t want to spend thousands of dollars on expensive optics. Vortex has a knack for making quality scopes that provide excellent accuracy, precision, and durability all the while staying incredibly affordable. Let’s start with the glasses. They are extra-low dispersion, which increases resolution and color fidelity. The lenses are also multi-coated to ensure all of the light gets transmitted into the lenses. What these features do is they guarantee perfect, vivid picture quality from dawn to dusk. Rest assured, you will have no complaints when it comes to picture quality if you invest in these lenses. Next comes the durability. Just by holding the scope in your hands, you’ll understand that this is not something that can be easily damaged. It is a solid one-piece tube with a hard anodized finish. This gives it durability and the ability to stand up to shock, recoil and unforeseen accidents with natural elements. The optical chambers themselves are just as durable as the rest of the scope. The optical chambers are nitrogen purged, and O-ring sealed to ensure waterproof and fog proof performance over years of extended usage. No matter if it’s rainy, or if it’s hot or if the temperature swings to extremes, the inside of the lens will never fog up or collect water. Dots at the center of the reticle takes all the guesswork out of windage and elevation adjustments. Plenty of shooters swear by BDC reticles as the best option for compensating for bullet drop over long distances. The 4X zoom range offers highly versatile magnification. The second focal plane reticle ensures your target maintains the same ideally-sized appearance. This gives you a lot of breathing space on your reticle to get your target in your crosshairs, no matter what the level of magnification. Moreover, this feature, coupled with the fast focus eyepiece makes spotting and acquiring your target a walk in the park. This scope comes in at number one on our list and for excellent reasons. The Diamondback range is very popular with ranch hands and is one of the best rifle scopes for ranch rifles available today. The only complaint a lot of people have with this scope is that the eye relief is a little low. However, the scope more than makes up for that with its host of extremely useful features. There isn’t anything stopping you from seeing your way through to a better hunt or target practice. Regardless of how good your shot is, there is always room for improvement. Of course, anyone can be an excellent shot without a scope, but you’re capable of so much more. With renowned brands like Nikon and Vortex, you know you’re getting the most value for your hard-earned dollar. No games. No gimmicks. No BS. What you see is what you get. Once you find the best scope for your needs, you’ll wonder what you ever did without it! Set one of these trusty scopes on your Ruger today. You’ll bring in more food, defend your home better, and put more trophies on the wall. The best scope for Mini 14 will easily become your next best friend. If you are a fan of shooting during the night, check which are the best thermal optics according to us.